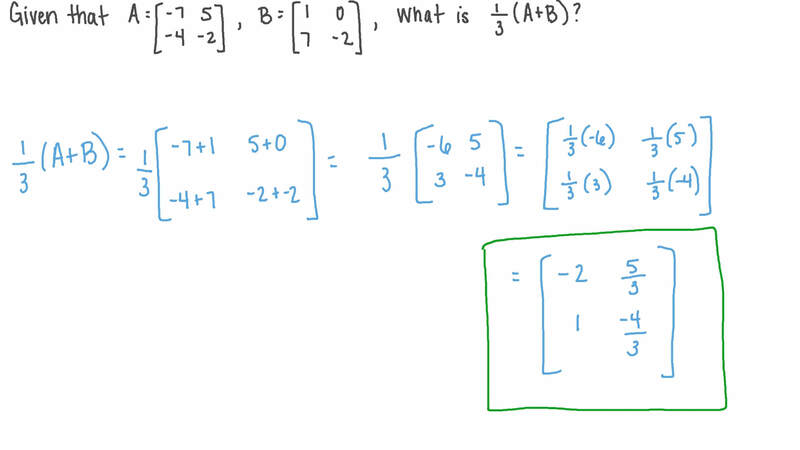 In this lesson, we will learn how to perform operations on matrices, such as adding them, subtracting them, transposing them, and multiplying them by scalars. 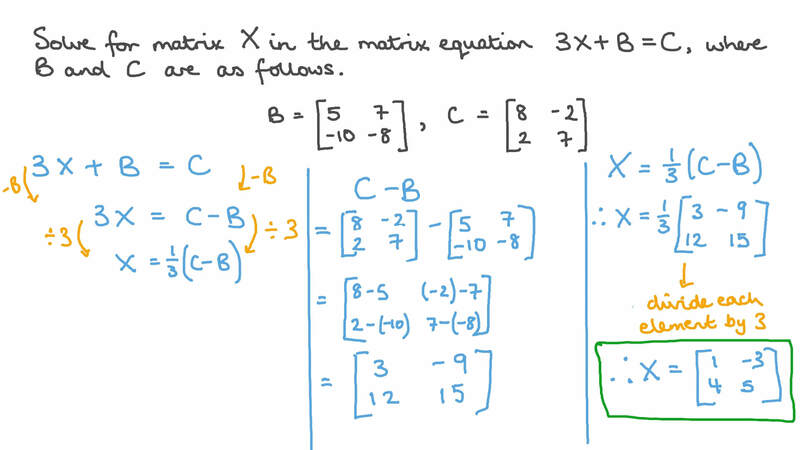 Find the sum of the following matrices. Given that what is 1 3 ( 𝐴 + 𝐵 ) ? Given that find 𝐴 𝑇 . If and , is ? Suppose that , , and . Find  𝐴 + 𝐵   𝐴 − 𝐵  𝑇 𝑇 . Given that determine  𝐴 𝐵  𝑇 𝑇 . Given that determine the matrix 𝐵 . Given that find the result of 𝐴 − 𝐵 𝑇 , if possible. If and then which of the following cannot exist? Given that the order of the matrix 𝐴 is 2 × 2 , and that of the matrix 𝐵 𝑇 is 1 × 2 , which of the following operations can be performed? 𝐽 and 𝐾 are two matrices with the property that for any 3 × 3 matrix 𝑋 , 𝐽 𝑋 = 𝑋 and 𝑋 𝐾 = 𝑋 . Are 𝐽 and 𝐾 equal? A No, they have different dimensions. B Yes, they are both the 3 × 3 identity matrix. C No, they are different matrices of the same dimensions. 𝐽 and 𝐾 are two matrices with the property that for any 2 × 3 matrix 𝑋 , 𝐽 𝑋 = 𝑋 and 𝑋 𝐾 = 𝑋 . Are 𝐽 and 𝐾 equal? A Yes, they are both the identity matrix. B No, they have different dimensions.